The Canadian Council on Animal Care is an autonomous and independent regulatory body that oversees the ethical use of animals in science within Canada. They are accountable to the Canadian public and are responsible for the dissemination of information on the use of animals in science to Canadians. 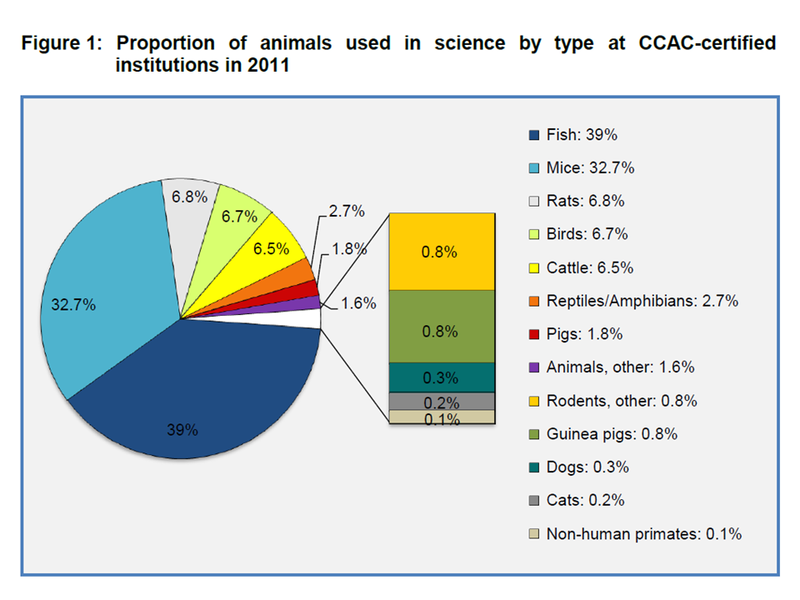 In December 2013, the CCAC released poll results that the majority of Canadians support the use of animals in research, teaching and testing. 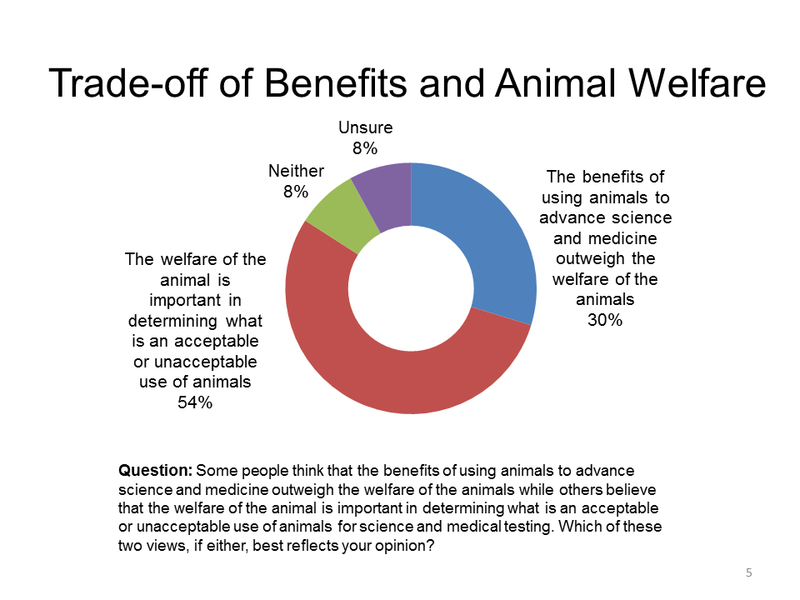 The poll was commissioned to gain a better understanding surrounding the current views of the Canadian public on the importance of animal welfare in science. Canadians don’t differentiate when it comes to the purpose of animal use in science. 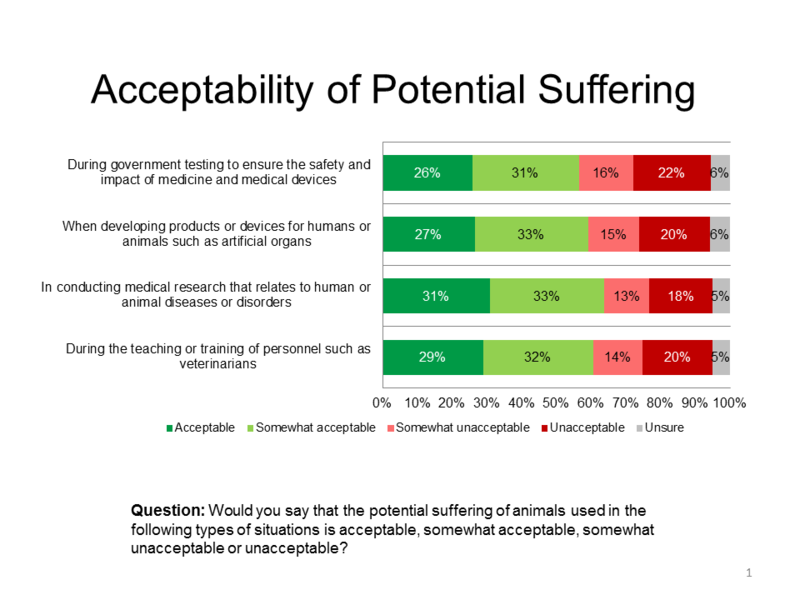 Roughly 60% believe the potential suffering of an animal to be acceptable or somewhat acceptable for safety testing of medicine, conducting medical research or teaching and training of professionals such as veterinarians. 20% of respondents think that any potential suffering of an animal is unacceptable. Additionally, the poll found that more than half of Canadians believe that the welfare of the animal is important in determining if the use of that animal in scientific research or medical testing is acceptable or unacceptable. A further 30% thought that the benefits of using animals to advance science and medicine outweighed the welfare of the animals. The position that scientific and medical benefits need to be balanced against potential animal suffering is one that the research community shares with the majority of Canadians. 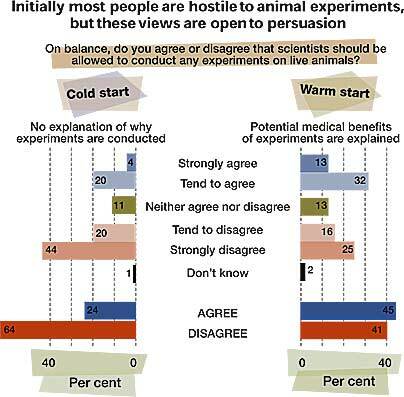 The reality is that Menache’s reference – a Ray Greek paper – finds its facts from a 1999 New Scientist poll (see below) which asked “On balance, do you agree or disagree that scientists should be allowed to conduct any experiments on live animals”. The question is neither limited to the “curiosity-driven” research, nor even to medical research (and pre-dates European bans on cosmetic testing). It should be noted that when some context was provided the poll showed that more people agreed with the research than disagreed. These still low acceptance of 45% (to 41% against) can be explained by the word “any” in the question – we might agree with those experiments passing ethical review, but most of us can conceive of an experiment we would disagree with (e.g. a hypothetical experiment with lots of animal suffering for little if any benefit). The truth is that the majority of people in these jurisdictions support animal research and this Canadian poll shows that the majority of Canadians support it as well. Basic research is not “curiosity-driven” research. It is work that is absolutely necessary to develop truly innovative treatments for many diseases and has been well explained previously. Other untruthful statements made by SUBCAR have been challenged here, here and here. The general public recognizes the importance of animal research to develop new safe therapies to treat disease and alleviate suffering in both human and veterinary medicine. 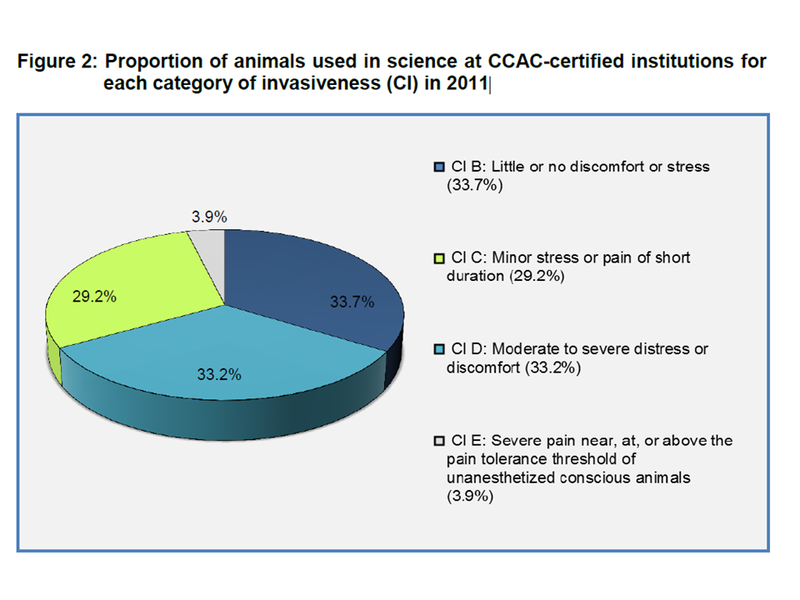 The CCAC has also released the Canadian animal use data for 2011. 3,333,689 vertebrate and cephalopod animals took part in studies during 2011; down by 1.2% when compared to the 2009 statistics (3,375,027). The three most-used animal types were fish (1,300,259), mice (1,090,730) and rats (225,971). Dogs, cats and non-human primates cumulatively accounted for 0.6% of the animals. These statistics do not include other invertebrate animals that are also extensively used in research, like the fruit fly Drosophila Melanogaster and nematode worms. The data is further broken down to categorize the invasiveness of the procedures and the purpose of the animal use. An example of a category B (33.7%) would be breeding of animals or the collection of blood. The catheterization of a blood vessel with appropriate analgesia and anaesthesia would be a category C (29.2%). Category D (33.2%) would include any major surgical procedures conducted under general anesthesia, with appropriate analgesia during the subsequent recovery. Procedures in which pain cannot be alleviated by using anesthetics or analgesics or that have the potential to cause severe pain or stress are considered a category E (3.9%). In this category studies could include animals that die without intervention (e.g. LD50, mortality as an end-point), studies that allow endpoints that are painful or stressful, pain research and noxious stimulation. The three most used types of animals in category E were fish, mice and guinea pigs. Within category E there was a 13% reduction in the number of animals used from 2009 to 2011. It is worth noting that animals are included in highest category of procedural invasiveness that they have the potential of being exposed to. Therefore not every animal in each category will have been exposed to that maximum level of invasiveness. Further information on categories of invasiveness can be found here. 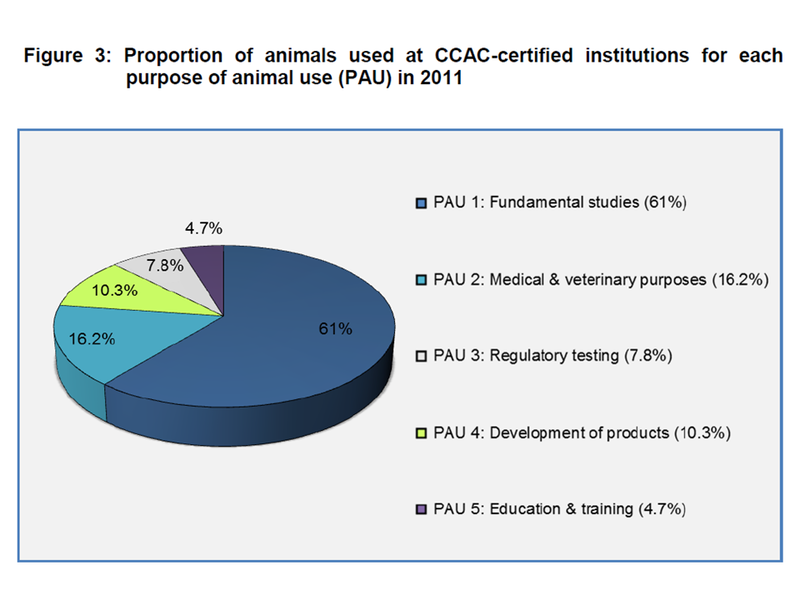 Basic research are studies of a fundamental nature in science relating to essential structure or function (PAU1) and accounted for 61% of animals in 2011. PAU1 saw a decrease of 294,609 animals from 2009 to 2011. Studies for the development of products or appliances for human or veterinary medicine (PAU4) saw an increase of 218,561 animals over the same time period representing 10.3% of animals in 2011. The proportions of the remaining 3 PAU categories stayed relatively consistent. As mentioned above Canadians’ support for the use of animals in science doesn’t differentiate when it comes to the purpose of animal use in scientific research and medical testing. That being said, the welfare of the animal is significantly important in determining if the use of that animal is acceptable or unacceptable. The CCAC occupies a pivotal role of encouraging transparency in the Canadian regulatory system by ensuring that the use of animals, where necessary, for research, teaching and testing employs optimal care according to acceptable scientific standards and communicating all relevant information to the Canadian public, to whom they are accountable. Posted on January 6, 2014 January 6, 2014 by EditorPosted in News, Outreach News, Science NewsTagged animal research canada, Animal Testing Canada, animal testing poll, animal testing statistics, Canadian animal use, CCAC. Why is Stop UBC’s response from yesterday not being shown? “Basic research is experimental or theoretical work undertaken primarily to acquire new knowledge of the underlying foundations of phenomena and observable facts, without any particular application or use in view”. A public survey of attitudes to basic research published and funded by the European Commission found that 68% of EU citizens are opposed to basic research (Q 22). felt there should be “more transparency and public participation in determining when and how animals are used in experiments” (Q 18). I can personally vouch for that sentiment, based on 9 years as a member of national animal research ethics committees (7 years in Israel and 2 years in Belgium). 4. There is consensus that animals cannot predict human outcome. 1. Basic research may not have a specific use in view. Understanding the spleen may not aim at a specific condition, but is vital if one is to understand how diseases may effect the spleen, and how it might be treated. Basic research will always answer specific questions, such as the action of a protein, or knowing the impact of a gene mutation, but at the early stage it is not drug development. Nonetheless it underpins drug development and is not merely “curiosity driven”. Your OECD definition does not suggest curiosity driven. 2. It wasn’t a survey. It was an opt-in questionnaire. It was hugely promoted by animal rights groups. It also pre-dates current EU legislation. A proper survey should randomly select its participants, its participants shouldn’t select the survey. 3. See above. But note Europe’s population is around 740 million. The Initiative also failed to the get the number of requisite signatures in over half the countries. 4. Ray Greek = consensus?! Give me a break. The huge volume of animal research based literature suggests otherwise. We will be posting a reply to some of Greek’s nonsense soon (later this month I hope). Note that Greek tends to quote researchers out of context (he even admits doing it at the beginning of one of his books – trying to defend the action).